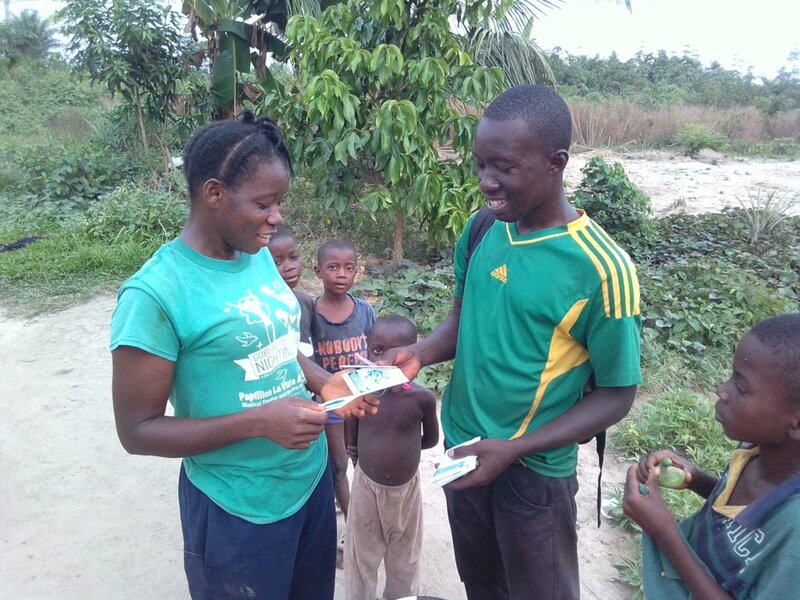 With your generous support, SPI's Liberian partners positioned their powerful gardening programs as a tool to move beyond Ebola. Now they, and we, look ahead at new ways to use the gains of strong local leadership, vibrant networks, and capable families that were developed in response to the crisis. One great example is an upcoming National Agricultural Camp and Agricultural Fair to be held this July by 4H Liberia. Help young people see agriculture as a profitable business and viable livelihood by removing the stereotype that agriculture is a poor person’s job. Allow students to share ideas through communication and leadership training. The participating schools are from Bong, Lofa, Montserrado, Bomi, Gbarpolu, and Margibi counties. A total of 126 participants will be invited to the camp, including 100 youth ranging in age from 15-22 years, and 26 adults. 75% of the crops that will be showcased at the agriculture fair are seeds from the SPI and seeds for garden practices at the camp will be SPI seeds. Thank you for your support to 4-H Liberia." What a wonderful example of how your donations not only fed families when no other options were available, but also give ongoing hope for a more resilient future led by a new generation. Thank you! Going forward, we'll keep working in Liberia to sustain our partner network. Our vision is to have capable trainers in the form of leader farmers embedded in each community, while key organizations continue to provide specialized knowledge and tools for vegetable growing. Our further vision is that Liberia continue to move toward seed self-sufficiency so that SPI seed does not have to be sent across the ocean. This is easier to achieve for staple crops like maize and beans than it is for vegetables. Yet it is possible with a combination of seed saving and continued development of local and regional seed enterprises. Watch for a new Liberia project here at GlobalGiving in the future. Until then, I hope you'll stay in touch. Contact me any time if you want to know more about what SPI and our partners are up to in Liberia and beyond. Naima Dido, our Program Director, is currently on the road with Nancee Neel in the mountains of Guatemala where they’re working to grow a deeper partnership with a relatively new partner, Pop Atz’iaq. An SPI neighbor, Nancee Neel, had served as an advisor and friend of the organization before she introduced us to their work. Established in the 1990s, Pop Atz’iaq has focused on craft-based livelihood development with women and men in the region around San Cristobal, and they have a strong track record of success. Catarina, the organization’s Director, reports that establishing a garden-based livelihood program has been a longstanding goal of the organization and its members. For context, craft-based livelihoods depend on international market outlets, and those can be fickle. Garden-based livelihoods are more reliable, and this program will help diversify their members’ options for income. Catarina reports that social and economic conditions are deteriorating this decade, due in large part to the lack of rural development support from the government. Child malnutrition rates have risen to 80% in most of the communities served. The road to reviving gardens after Hurricane Matthew has been a long road, and we’re working with partners who are in it for the long haul. Little Footprints, Big Steps (LFBS) is one of those partners. They’ve recently shared an update about how they’re working to support communities affected by Hurricane Matthew, providing a snapshot of where gardens fit into the larger picture of recovery and rebuilding. We’re sharing this with you because we’re proud of their work, and we think it’s a great example of how many different pieces need to come together for folks to rebuild their livelihoods. “Since Hurricane Matthew we have been able to build Maxima prefabricated homes for over 21 families! Homes built or repaired, crops planted, medical outreach clinics regularly underway, children attending schools, parents starting businesses, and the addition of livestock – the recovery and rebuilding of the families in rural communities, whose lives were shattered by the October 2016 Category 5 hurricane, continues in great strides through the dedicated LFBS staff, collaborative partnerships… and your support. Projects do not succeed in a bubble. Projects are accomplished by people working in a specific social and environmental context, and sometimes we can forget about that context when we’re sharing stories about the amazing work being done by our partners and their communities. Because we rely on our partners to lead projects in collaboration with their farming communities, we also strive to understand the contexts in which they work. Our current lead partner in East Africa, GrowEastAfrica, works with about 1,000 families, most of whom are IDPs. These families are from tribes and regions that have been targeted for displacement for hundreds of years. One tribe, the Burji, are known for their agricultural expertise, and they are working with GrowEastAfirca to pilot garden programs that can help re-establish livelihoods for other IDP groups. (You can read more about the Burji in our recent report from a related project.) As an Ethiopian-American led organization, GrowEastAfrica understands where these families have come from, the experience of displacement, and what they need to be successful in their new home. Specifically, co-founder Yohannes Chonde’s ancestral home is in the area now known as the Burji District. Burji land was seized and Burji families were heavily displaced between 1890 and the 1990s. More recently, the Ethiopian government has recommenced commandeering land that has traditionally belonged to farmers. Understandably, people have responded by participating in anti-government protests throughout the Oromia region. These protests led to a ten-month state of emergency that was eventually lifted in August 2017. However, the state of emergency was reinstated when Prime Minister Hailemariam Desalegn resigned in February 2018. Last month, the Ethiopian army opened fire on civilians in Moyale, reportedly as a result of faulty information, killing 9 and injuring 12 others. Nearly 10,000 Ethiopians subsequently fled from the Ethiopian side of Moyale toward Kenya in search of safety. Moyale residents have lived through and survived their own share of ethnic conflicts, and now the population of under 150,000 suddenly has 10,000 more lives to support. Our goal is neither to sensationalize nor to normalize what these families face, but to offer a deeper understanding of the daily context that our partners and their farmers experience in their communities. In response to the influx of IDPs, GrowEastAFrica reports that many of their program recipients, who are also IDPs from past conflicts in the region, helped new refugees settle in by sharing what little they have. The region still suffers from the ongoing effects of drought, leaving locals with the burden of helping their displaced neighbors where rains and humanitarian assistance fall short. As the month of March was coming to an end, the refugees in Moyale eagerly awaited news of their new leader, hoping that whomever is elected will bring calm and chance return home. As the PM resumes his role of mending his broken country, efforts to repatriate the refugees are now underway. For now, GrowEastAfrica is working on acquiring new arable land, facilitating access to water, offering training to augment refugees’ traditional knowledge, and ensuring that folks have high-quality agricultural inputs that will help ensure a successful harvest. They have also encouraged the community to help incoming refugees, and they’ve worked out a cash assistance program for current famers who are willing to do so. 90% of the refugees in Moyale were relocated to a temporary camp in Somare on land that was being prepared for a community garden in anticipation of the seasonal rains. Plans for the community garden have been temporarily suspended to make space for the refugees. Always moving forward, GrowEastAFrica recently leased two acres of land from the government, enough for 30 women to farm. A 10,000-liter tank was installed near the garden site while the land was being prepared, and planting has already begun. Because good quality seed was available in the area, SPI worked with GrowEastAfrica to source carrot, onion, tomato, cabbage, cauliflower, spinach, broccoli, hot pepper, bell pepper, beets from a local provider. As new refugees settle in, this project is being adapted to address both existing and emerging needs. Additional water tanks, seed, tool banks, and agricultural training are all on the horizon. Your gift has been instrumental in supporting Yohannes and GrowEastAfrica, and in making this program possible. Thank you.